I'm very happy to inform you all that my "Bourbon Biscuits" recipe is selected as one among the top five recipes for this month's contest at Manjula's Kitchen. They have voting system to select the top two recipes. You can vote till Dec 3rd and I need all your support and wishes. Please click here to vote. Thanks to all my lovely friends who have voted for me so for. wow dear... seems like u r a big shot ahhh..300 posts awesome..
thanks for dropping by my blog, no doubt am gonna b ur follower..
voted for you dear...All the very best & keep rocking. we are happy for you!!! Congrats Nithu..I have voted !!! thtz a gr8 honor Nithu. U rock madam.. Thanks Love, Sandhya, PJ, Beena, Kanchana Maam and Gayathri for your wishes and support. Congrats Nithu and all the very best. Nithu dats very good....i amsurprised...i love borbon and now i can make it...wat else do i need. 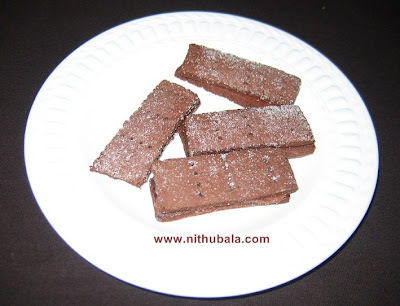 Congrats Nithu,biscuits look delicious and are easy to make. Congrats on the selection Nithu! Well deserved! My vote surely goes for you! Congrats..happy to vote for u..Keep rocking nithu..
Biscuits look tempting and delicious!! Thanks for your comments on my blog. You have equally beautiful blog. Will surely follow it and try out some recipes from here. Thank you so much Pushpa, IndianSpiceMagic,MD,Suneetha, LR, Sush, Mano Mam, Swati, Jagruti and Mythili for your wishes and support. Congrats nithu..biscuits looks so perfect..YUM! Congrats Nithu...what a lovely space u have....thanks a lot for taking time to visit my space and for those encouraging yummmy comments. I am drooling over ur biscuits. You have quiet many interesting recipes here.. Bourbon Biscuits are my favorite and hard to find it here. Hey Nithu..just voted for your Bourbon biscuits at Manjula's kitchen...They look awesome and deserve to win. Good luck. Congrats...they look so good and perfect..Bourbon biscuits take me down memory lane being my all time favorite. Congrats Nitu,,,,,Loved your biscute recipe as well as your blog....Love to follow you.....nice blog you r having here..